Many art and design educators look to the idea of the lateralisation of brain function (crudely put, that the left side of the brain engages in linguistic activity, science and so on, while the right side is mainly occupied with feelings, symbols and images) as offering some direct explanation for the way artists and designers think and work. In truth, such ideas are relatively insignificant. While they do have some foundation in neuropsychological studies, there is no such thing as a ‘left-brained’ or ‘right-brained person’ (unless they have had a sizeable lobotomy). Such ideas are more representative of an inclination in us all to  reduce the complex issues of visual communication and expression to something familiar and easily understood. Yet, utilising the left / right brain idea to make the much broader argument that our society as a whole is shifting from a text- to an image-based culture is just what David Crow sets out to do. Crow maintains that the advent of new media such as television, computer and the mobile phone, alongside the visual pictograms and symbols of pioneers such as Otto Neurath and C. K. Bliss, have initiated a major shift from text to image in mass communication. Crow’s study begins with an analysis of television’s early challenge to the authority of the word. His brief history outlines the impact television had on encouraging an associated growth of pictures in magazines and advertising. This makes for a promising start, with Crow offering a critical context that strives to chart the broader reception of television and its then perceived threat to literature. The historic control exerted by various authorities over the regulation and definition of written language provides one of the more interesting themes that permeates the whole book. From here, Crow goes on to look at the work of Neurath and Bliss. These segments offer some fascinating detail (and images) of Neurath’s isotypes and a brief, but equally absorbing introduction to the work of Bliss (it is also refreshing to see the designs of this much neglected figure receiving recognition). It is a shame, however, that these opening sections then give way to a rather unfocused assortment of chapters composed of case studies, asides on the alphabet and the occasional repetition of work already discussed. Looking at punk graphics and diy typography of the 1970s is interesting, but, really, how significant is Fuse Magazine, the work of Peter Saville, or that of Malcolm Garrett, to the increasing global dominance of visual modes of communication? It is never really made clear why this work is considered significant as part of the broader aim of looking at ‘the cultural shift from words to pictures’. Admittedly, Crow only sets out, as he notes, ‘to provide a series of doorways’ into the subject. 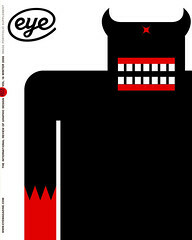 Yet, by seeking to support such a grand hypothesis with the work of a small group of British graphic designers and their magazines, one is left with the impression of someone passing off their personal interests as evidence for the ‘turn to the visual’ in the second half of the twentieth century. Left to Right is clearly aimed at the graphic design / illustration student. And knowing this goes some way to explaining why the book never really succeeds as either a theoretical critique or historical study. Like Crow’s previous work, Visible Signs (reviewed in Eye no. 50 vol. 13), Left to Right attempts to bridge the gap between classroom theory and studio practice. While this remains a worthy effort in an area of graphic design history critically short on any meticulous research, the diversity of critical ideas and material addressed here is simply too diffuse to sustain a coherent and consistent argument. The overly crude connection made between cultural forms and brain activity that marks the title just sets the tone for a work that repeatedly cuts short any real engagement with the issues at hand.